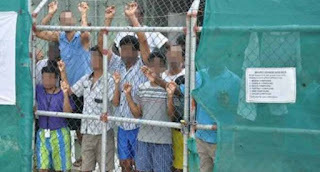 The Turnbull government has given its strongest signal yet that a deal is in the wind with the United States to settle 1,800 refugees from Nauru and Manus Island. The Australian newspaper reported that Australia and the US were expected within days to announce the resettlement arrangement. Speculation has been mounting about a deal since Australia announced at Barack Obama’s global migration summit in New York in September that it would take refugees from camps in Costa Rica. Since then, the Coalition government has introduced legislation to place a lifetime ban on asylum seekers who have arrived by boat from ever travelling to Australia once they are resettled in other countries. The defence industry minister, Christopher Pyne, would not confirm the deal but he said if it did happen it would be a win for the government. “If it’s the case, it will be another great achievement from the Turnbull government,” he said on channel Nine. Pyne also said there was plenty of time to make an announcement before the inauguration of US president-elect Donald Trump on 20 January. Manus and Nauru include people from from Sri Lanka, Pakistan, Bangladesh, Iraq and stateless people. Labor frontbencher Anthony Albanese said a deal would be a good thing. “These are people who are refugees, who have been found to be refugees, who, if they are settled in a country like the United States, that will be a good thing,” he said. The Coalition has refused to comment or speculate on potential third-country negotiations to resettle the refugees. On Melbourne radio station 3AW on Friday, the prime minister maintained his silence on the issue. “There’s always speculation about these things ... and we never comment on them,” he said. The Coalition’s latest migration bill, which would impose a lifetime ban on an estimated 3,100 people, has passed the lower house of parliament but is yet to clear the Senate. Labor, Andrew Wilkie, Cathy McGowan, Greens MP Adam Bandt and Nick Xenophon Team MP ­Rebekha Sharkie voted against the bill in the lower house. The immigration minister, Peter Dutton, said the government had support for the bill amongst the Senate crossbench. He would need eight of the 10 remaining crossbenchers to pass the bill.